One of the great lessons we’ve learned in the wilderness season is this: disappointment is short-lived. Now, when we’re disappointed with God’s plan for our lives, we just have to wait a little while longer until we begin to see its purpose and, eventually, its value. God has never wasted a sorrow, heartache, a difficulty, or a trial in our lives. Our great disappointment is not in God but in our impatience and dullness of heart to trust and believe. One of our early tests in the jungle was when we picked up our children from our mission school and took them with us into our jungle village for their summer break. Our mission plane had been grounded by the government of Panama because they thought that we were CIA agents, so we had to take a long canoe trip into the jungle. We had no idea what was ahead for us. 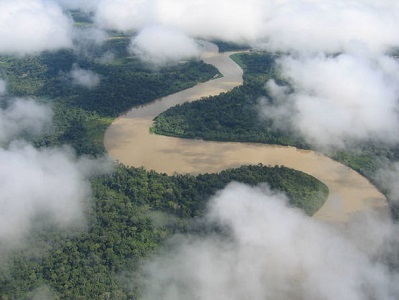 We had no idea that the Chucanaque River that threads through the Darien province of Panama is known for unpredictable floods. One moment the river can be smooth and placid, and the next, the rains upriver can cause it to violently overflow its banks. We were making the trip with Charity, our oldest daughter, who was only seven, Joy, who was six, and David, our infant, who was only five months old. As we loaded supplies and our kids into a narrow dug-out canoe, we noticed that upriver storm clouds were forming. It had already begun to rain, but we set off into the river anyway with our native guide, as we were anxious to get to our jungle home with the kids. Then suddenly, without warning, we were struck by a rushing wave caused by a massive, spontaneous flood. It was like a tsunami had instantly picked up our canoe and flipped it over! We were all thrown into the rushing river that was now driving us backward. And the river was full of downed trees, destroyed houses, and all kinds of debris that was wildly rushing downriver alongside us. It was like an amusement park ride minus the amusement! In a flash, we saw men in small canoes emerging from the banks of the river. Paddling with all their strength, they were coming out amongst the rapids and dangerous debris to rescue us. We believe this was an angelic host, a Heavenly response team sent out by God to answer our cry. They lifted us out of the waters one-by-one and took us ashore. Candice and the children were taken to shore in one place and Brian another. Separated from each other along the banks of the river, we each prayed and asked the Lord to watch over us and reunite our family. Later that day, all five of us were reunited, and we embraced as we rejoiced in God’s goodness. God had rescued us! We will never forget that day and our joyous reunion as the Lord performed a miracle for us. We were alive and we did not drown! We thanked the Lord for sparing our lives and that we still had an opportunity to finish the work God had called us to. We were not disappointed that God had allowed us to face the flooding river, nor that we had lost all our supplies for the next three months of living in the jungle. Rather we gave thanks. It only made us more resilient to go back in. God is so faithful! Not only were we spared, but he used the whole incident to show our village his love. What a redeeming Father! When we finally arrived at our village and recounted the ordeal back to our new Kuna friends, we will never forget how they just stared at us for the longest time, wondering why we had come back. They wondered why we would still want to stay and live with them instead of going back to Merki-neg (America). Years later, when many in our village had turned to Christ, they pointed back to that incident. They told us they knew when we returned to the village after the accident that God had sent us to them, because we didn’t turn back and leave them like they had expected. They realized that God had spared our lives so we could deliver the message of life to them. We want to encourage you to never give up or grow impatient in your hour of distress or peril. If you find yourself in a wilderness, know this: it’s to make you strong, not bitter. If you wait in a wilderness long enough, your God will deliver you. He takes note of your heart and listens to your cry. He will not fail to come and rescue the one that he delights in. The wilderness of clay has much to teach us. If we fail to be molded by the Master, he may pass us over and succeed with another generation. This is what happened with the Hebrews: in the desert (this “wilderness of clay”) was when “the whole community grumbled against Moses and Aaron,” (Exodus 16:2). In our desert days, God is working behind the scenes daily to bring our hearts to faith and stamina, training us for battle. But more often than not, we run from God while we grumble and complain. Most often we grumble against our human leaders, but deep within, we’re really bitter at God. The wilderness only exposes our pain and disappointment with the fathering of God. The experiences of the Israelites teach us so many good lessons about God and his ways. As we see their failures, we begin to see our own. As we learn the lessons they failed to learn, we hasten his progress in our own hearts. It makes it easier for us as we make our journey toward Christlikeness. Has complaining become a way of life for you? Has the wilderness of clay begun to squeeze you into an uncomfortable place? Let’s not fail to learn the lessons God has set before us while we’re there! Many contemporary Christians are inclined to think that those who are spiritual live their lives by “mountaintop experiences,” and they feel that a continual spiritual euphoria is required in order to walk in a realm of victory and joy. But Paul and Silas were men of a different breed. While in chains with their bodies battered and bruised, they rejoiced and praised God in the midnight darkness. God will not allow us to live on endless mountaintops. He has destined us for glory, a glory that comes through many trials, tests, and toils. Adversity brings maturity. This is why the north winds of adversity are necessary for God’s growth plan for the believer, (Song of Songs 4:16). Trials and tests are fertilizer for the soul. Can you ask the Lord for the wilderness winds? They only come to make you strong! We find it so interesting that God didn’t tell Moses ahead of time about the forty-year period of the wilderness. In essence God told him, “I’ll take you out, and I’ll lead you in.” It was the in-between time that God didn’t explain! There are times he doesn’t fill in the blanks; he simply leads you to an in-between place and keeps you there until Christ’s life and nature emerges from within you. He reaches his loving hands into the substance of your inner nature and squeezes, forms, and shapes you into a replica of Christ. He will use the in-between place to do his great work of shaping you into the beautiful image of his Son. Be assured that the place of testing and humiliation is not where God leaves us. The end with the Lord is mercy and grace, (James 5:11). Just ask Job! God will not crush us, for Jesus was crushed in our place. Jesus will lift up the bruised reed and fan into flame the smoking embers, (Isaiah 42:3). The Lord is tender even in the trials that come to us. If we will seek him in our weakness, we will learn about mercy like never before. When the test is over, we will find that God is there and that he was so kind to us, really kind! Another lesson learned in our wilderness season was this: God does not count our failure as a failure unless we allow ourselves to be stuck there. It’s also important to note that a continuing state of being stuck in failure will lead to a habit of unbelief and disobedience that will eventually bring you to a dead end. Only you can determine what you’ll do with your life. God forgives, guides, instructs, and corrects you, but you are the one who determines if you will stay stuck in the past or move into the triumph of Christ. Perhaps the closer you get to your conquest, the tougher the training becomes. It may seem like you’re going from one wilderness to another with no oasis in between. Those who walk beside us will soon see our failures and our issues. But God’s everlasting grace is our hope and true strength. We made a vow years ago that we would never waste any wilderness nor turn back in unbelief like many of our ancestors did – but if he would just draw us, pulling our hearts closer to him, we would run after him to the end. Are you ready to make that vow too? When you’re in the wilderness, it seems like spiritual warfare grows more and more intense. Jesus was led into the wilderness to face the testing and temptation of the devil. There were more demons coming against Christ in that wilderness than you and I could have ever imagined. All of hell was focused on stopping the Son of God from fulfilling his purpose in coming to Earth. And so the devil and demons will fight you and tempt you sorely as you get closer to fulfilling your purpose and destiny. The closer you are to the threshold of breakthrough, the hotter the warfare becomes. David’s wilderness experience in the Desert of Judah was pretty rough. He was probably thinking, I don’t look like a king, and I don’t feel like a king. What kind of kingdom is this? And as he was chased by a demonized leader, he could only cry out to Heaven and learn firsthand the lessons of spiritual warfare. We have to seek God early, thirst for his presence when we are dry, and not give up when all the outward signs seem to indicate defeat – that is what describes wilderness warfare. There is no hint of revival, no special meeting, and no sense of presence of God. There’s just a passionate, seeking heart that finds grace in the wilderness. Not only is Jesus an expert when it comes to dealing with demons, he also provides for us in the wilderness when it is dry and there’s no water: “Look! I’m about to do something I’ve never done before! It will spring up right in front of your eyes – can’t you recognize what I’m doing? I will open up streams in the desert and paths through the wilderness,” (Isaiah 43:19). Why not keep a journal? You’re going to learn so many fantastic truths about God in the coming days. God is providing everything you need to become like his Son. His care for you includes meeting every need, even in a wilderness. Yes, keep a journal. It may become your own book on your wilderness experiences! Though a flood overtakes you, I will lift you high. Though fires burn around you, I will be your shelter. Though many voices may speak to accuse, I will be your peace. Haven’t I saved you a thousand times? You see but one, but I see the many times I have rescued you, sheltered you, covered you, and protected you from your folly. Take rest in your Father’s works. Take joy in your Father’s love. This day I will open your eyes to see my salvation in your life. The day of the Redeemer has come. My redeeming grace will be unveiled before you. This is the day that I will arise to redeem your life and restore it fully back to me. From today forward my presence will be upon your life in unmistakable ways. My face will lead your steps and protect you from all that may come against you. Though a raging flood threatens you, I will lift you high, and you will see my glory, for the day of the Redeemer has come!